Structures jutting up from isolated patches of dusty desert are not too uncommon in this part of the world. And the camels ambling past the freshly painted red iron fence in Al Ain are no rarity either. But the building itself is an oddity in the United Arab Emirates. Under Islam, the official religion, burial is the only option when somebody dies. 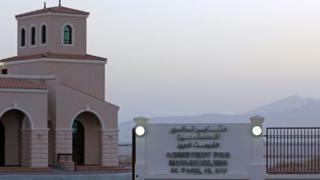 This is the UAE's newest crematorium - and the only one in the Gulf to have a non-Muslim graveyard alongside it. Opened in January this year, it is intended to meet demands of non-Muslim expatriates in a country where an estimated 85% of the 8.2 million residents are from other parts of the world. "People from all over the globe move here, work here, raise families here, bring up children here," says Don Fox, chief executive of Al Foah Funeral Services, which runs the crematorium and the non-Muslim cemetery contained within the grounds. "And unfortunately some of them die here. We're here for those people who do pass away." About 4,300 expatriate deaths were officially recorded in the emirates of Abu Dhabi and Dubai alone in 2010, according to the latest available figures. But while catering to that market will allow Al Foah to runs as a stand-alone business, its establishment was only financially viable because of state backing. The oil-rich Abu Dhabi government donated the land and constructed the building at an estimated cost of $10m. The machine used for cremations added a further $2m to the bill. For the state, says Mr Fox, it is a way of showing respect for other religions. And for some residents it clearly meets a need. "There are many expatriates who've been here a considerably long time and regard this place as their home. They have no desire to be transported to their native place for burial or cremation," Mr Fox says. In its first four months, only about a dozen cremations - of people from Austria to Australia - have been carried out. But the firm is optimistic that they will become busier when world spreads. Within a month it hopes to have prepared scrubland so it can be used for burials too. "A lack of water though means we can only landscape about half of it," Mr Fox says. For those who want to return loved ones to their homeland, repatriating bodies and navigating red tape is another service that is in demand. And Al Foah has just signed an agreement with the cargo division of Abu Dhabi 's national airline Etihad to handle the transportation of remains and ashes. "It helps us as a business because as well as knowing we can offer a good service, we also know what price to quote for anywhere in the world," says Mr Fox, adding that the price of a cremation or funeral within the UAE is another reason why some opt for it. Repatriating a body to Europe, for example, will cost at least $10,000 (£6,220; 7,610 euros) once funeral director fees have been taken into account, he estimates, saying it can cost a quarter of that in Al Ain. Until now, local burials have taken place on the existing non-Muslim cemetery - a small rectangular patch of ground managed by the local council, and just a slow trudge 500m through sand from the new building. Its fence too has a new lick of paint, but the old rusting barbed wire remains, as do spray cans used to give the new structure its shiny finish, adding to a sense of neglect. There are about 50 graves - and those with conventional gravestones give a flavour of the origins of those buried here. Countries from the Indian sub-continent feature heavily, and Mr Fox says people from those nations - usually men - make up many of the expatriate deaths in the country, with road accidents and incidents on construction sites, which rely so heavily on imported labour, taking a toll. "There are building sites round here which have thousands of workers," he says. "Sadly they have incidents like everywhere else." And while it may seem hard-headed and cold, this is a market identified by Al Foah. Employers have a legal obligation to contribute towards the funeral or repatriation costs should such deaths occur, Mr Fox says, adding that the option of a lower-priced service, if a victim's family agree to a cremation or burial within the country, can save money for employers and families. Back inside the main building, a 300-capacity worship hall where funeral services are held has a large wooden cross on the wall. "We pride ourselves on being multi-faith," says Mr Fox gesturing to the crucifix. "That's detachable. It's just that in the last service we had here, the deceased person was a Roman Catholic. Sikhs, Hindus, Buddhists, as well as various Christian denominations, have used the building." Mourners can have the room decorated by a local florist and the site is also creating work elsewhere in the local economy. While most coffins, for example, are imported from China, some are made by a local craftsman, "especially when the deceased is unusually proportioned - very large or very tall", Mr Fox explains. And he adds that while the site has strong local support, it is coffins which provoke the largest amount of cultural bewilderment. "Many of my Emirati friends cannot quite grasp the reason why we non-Muslims go to great expense and a great lot of trouble to manufacture a box of high quality timber, fancy linings, fancy cushions etcetera, purely for it to go into the cremator and be burned or to be buried in the ground never to be seen again. "This doesn't quite come over as a practical exercise."